Alfa Laval ACE air cooled exchangers provide unmatched cooling performance for the entire oil, gas and power supply chain. For over 50 years, these air cooled exchangers have been custom-designed and manufactured for upstream, midstream and downstream applications – specifically in the gas compression and gas processing markets. With custom coolers available for a wide range of capacities and duties, the Alfa Laval ACE product range offers robust, rugged and efficient cooling solutions that outperform other models, and consistently earn the confidence of our customers time and time again. With the global strength and reach of Alfa Laval, the ACE air cooled exchangers are a key part of an even more comprehensive array of heat transfer products for cooling air, natural gas, oil and water. Alfa Laval’s longstanding history in the heat transfer market, combined with additional investments and capability enhancements, help to ensure Alfa Laval ACE products will provide an even more robust, highly engineered air cooled exchanger solution. With our global capabilities, we leverage worldwide resources to help reduce delivery times and overall equipment costs. We offer service and support around the clock for the complete Alfa Laval ACE air cooled exchangers range – helping to deliver peace of mind regardless of our customers’ location. With decades of experience, our sales team has the expert knowledge to ensure the optimal air cooled exchanger is matched and designed to meet your specific duties. With a streamlined quotation process, and an in-house proprietary rating program, Alfa Laval quickly and efficiently customizes the right air cooled exchanger – providing our customers with fast, accurate quotes and specifications. Our extremely flexible engineering team utilizes proprietary drawing and sizing technology to reduce lead times, and rapidly produce detailed 3D AutoDesk Inventor models and accurate drawings – supplying customers with advanced engineering information. 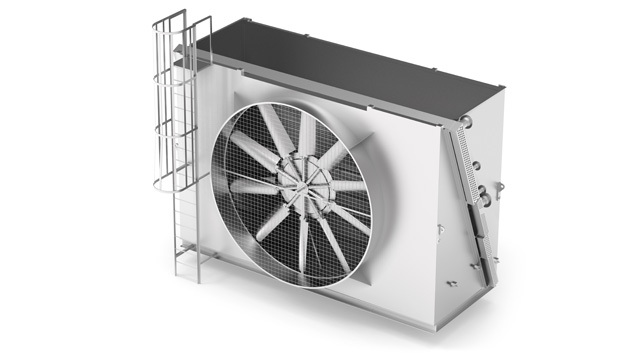 To meet the quick deliveries that our customers demand, we manufacture nearly all of the components that go into our coolers – including not only the structure and headers, but also the louvers and high-performance fin-tubes. With additional factory investments and enhancements, Alfa Laval will continue to advance our manufacturing capabilities to supply customers with high quality air cooled exchangers, while also helping to reduce their overall investment by leveraging our global purchasing and sourcing capabilities. The strength of Alfa Laval’s worldwide service network enhances our dedication to the service and support for the ACE range of air cooled exchangers. With service and support available 365 days a year, our customers benefit from added peace of mind around the clock. Alfa Laval helps to extend performance, deliver maximum uptime and optimization, and offer a suite of innovative performance agreements and service solutions. The Alfa Laval ACE air cooled heat exchangers offer robust coolers that have been designed with a harsh environment in mind. Quick and reliable response times combined with accountable technical support provide the basis for ensuring a competitively priced product, designed and delivered on time. The finned tube technology used enables these air cooled heat exchangers to reach high temperatures and pressures when necessary. Alfa Laval ACE air cooled heat exchangers are coolers especially engineered for applications in the natural gas field, where compressed natural gas, lube oil and water can be cooled in the same unit. With Alfa Laval ACE air cooled heat exchangers we offer an unparalleled service – our advanced sales and engineering system provides our dedicated sales team with the ability to respond rapidly on project-specific requests. The dispatch continues to be responsive, with an efficient operations team focused on fast delivery, along with safety, quality and improved manufacturing capabilities. Custom-designed to meet specific customer specifications, Alfa Laval ACE air cooled exchangers are engineered for the upstream, midstream and downstream oil and gas markets. All models feature a rugged design with superior welding and construction quality ensuring ultimate cooling performance.